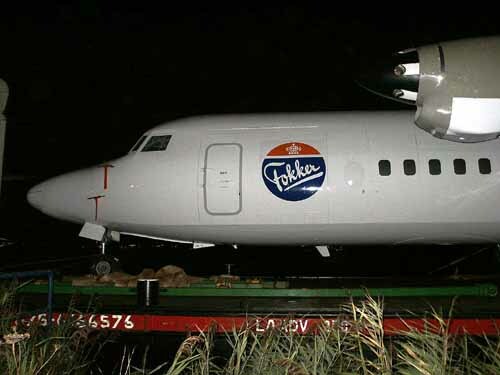 On this date the last remaining airframes (except one) at the Fokker Aircraft Industries complex, for Aviodrome's Aviation Theme Park at Lelystad, were to be transported from Amsterdam IAP to the new museum that is nearing it's formal opening next month. Most of the work had been done when I arrived on the scene and things had progressed smoothly. I was just in time to see how this Lockheed Neptune was hoisted on the barge. Due to the size of the transport, these fuselages were going to travel over water to Lelystad. This Lockheed P2V-7B Neptune wears registration 210 and its constructionnumber is 726-7263. It was never owned by the US Navy and thus lacks a socalled "Bureau Number". It was delivered to the Dutch Navy (: Marineluchtvaartdienst") from the Lockheed factories and entered service on 16Jan1962. It was used to train crews and technicians at Marinevliegkamp Valkenburg (Naval Air Station) for the operational squadron VSQ 321 in New Guinea (Biak). 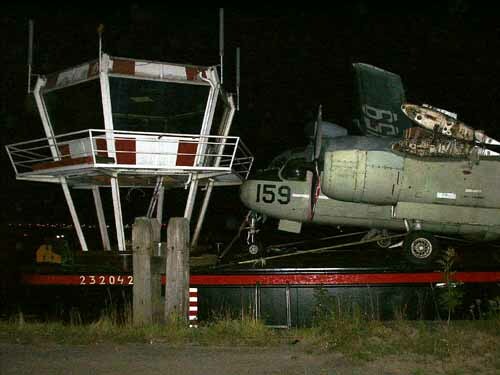 It is of course a very delicate affair to hoist this aircraft on the barge; all movements were done slowly and carefully to prevent swinging. "210" served with the Dutch Royal Navy from 1961 until 1982. Designation P2V-7B was revised in P-2H, following the changes with the Americans. 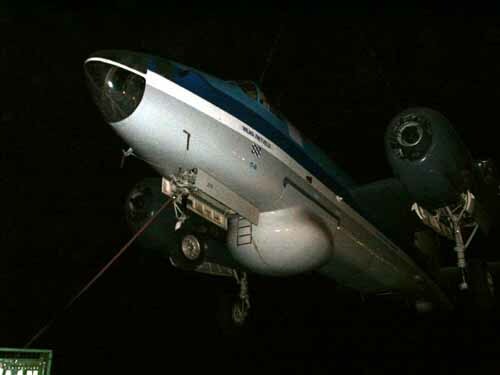 Between 1963 and 1966 alle Dutch Neptunes were reconfigured to anti-submarine surveillance, including the perspex nose and again redesignated to SP-2H. The first 2 aircraft (209 and 212) were converted by Lockheed in Burbank, the others by Aviolanda in Woensdrecht. Apprentice engineers of KLM used to practice on this former Dutch "Marineluchtvaart Dienst" Neptune; since in-house training was stopped years ago, the Neptune was donated to the museum. Restoration will need to go a lot further than these markings on the tailfin ! The 210 was the last P-2H Neptune reconfigured to SP-2H (1966). It operated with VSQ 320 and sometimes with VSQ 2 or on rotation at Hato, on the Dutch Antilles. It was struck of charge on 15Jun1982 and stored at Valkenburg. In 1983 it was made available to the KLM, as instructional airframe. 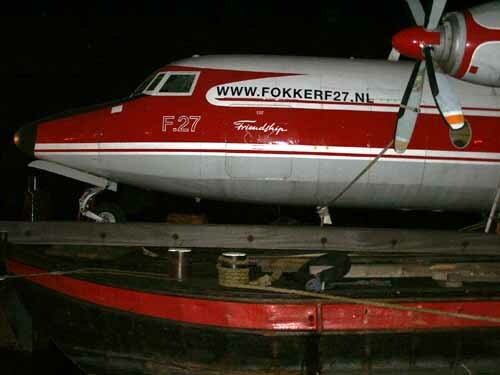 Dutch Aviation Authorities refused permission to ferry it to Amsterdam IAP and it was transported over the road and by water (14-16Dec83). It made the national press at that time, much the same way when it left Schiphol for Lelystad ! The propellors remained behind at Schiphol and were used to test the engines of "Dutch Connie" N749NL during its restoration. 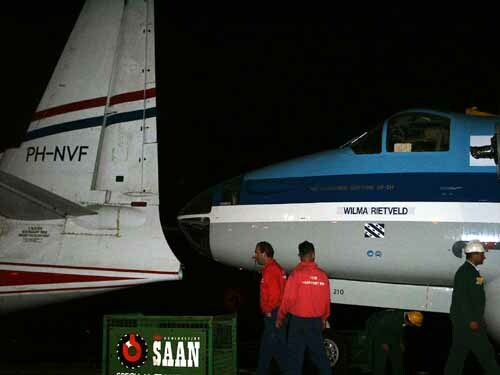 It was a close fit behind the Fokker F.27 PH-NVF. . The name "Wilma Rietveld" refers to a one-time secretary of the Aviodome museum. 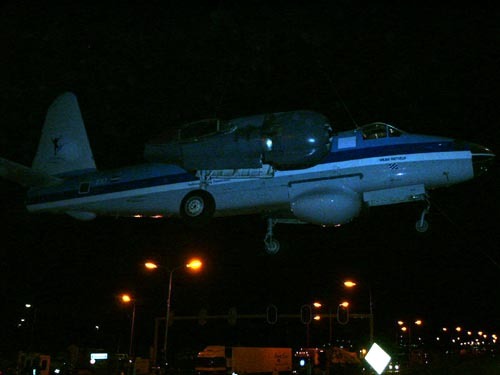 KLM had cancelled ground training on aircraft such as these by end-1980s and after years of storage KLM made inquiries with the Dutch Navy for preservation with the military; transport was found too expensive by the Dutch military, but the Aviodome showed more enterprising spirits and accepted "210" on 18May98. 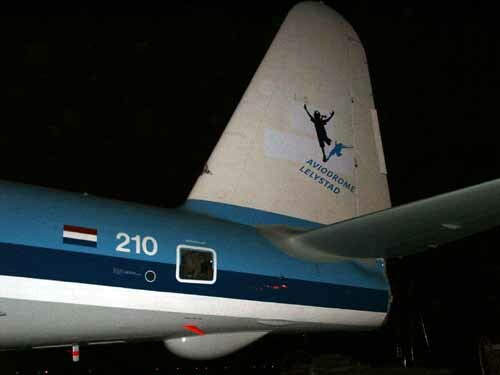 During festivities Mrs Rietveld revealed .... her name on the aircraft, no doubt much to her own surprise. The previous name of the aircraft, 'Jelle A. Stellingwerf', is hidden under the 'Rietveld'-sticker. PH-NVF will see a new home in Lelystad. It's a wonderful thing to see so much of Dutch Aviation Heritage going to be preserved. This aircraft (c/n 10102) was built in 1957 and the F27 Friendship Association is working to get it airworthy again in 2005: the 50th anniversary of the Fokker Friendship. See it displayed at the Aviodrome, dec.2003. The Fokker F.50 prototype PH-OSI (c/n 10688, manufactured 1986) joined the transport as well; sad to see these quality products of Fokker this way: a reminder of a great aviation tradition in the Netherlands, of times when Fokker produced aircraft that could compete with any other airplane manufacturer, except on marketing scale and pricing. See PH-OSI displayed at the Aviodrome, dec.2003. This Grumman Tracker stood guard with the former Aviodome Museum, at Amsterdam IAP, for many years. It has been a while since this Tracker went over water: it operated from the Dutch aircraft carrier "HMS Karel Doorman", which was sold in 1967. It shares space on the barge with a small air traffic control tower, which had been in use at Amsterdam IAP until 1991 as an emergency atc tower. The one airframe that is still at Schiphol is Lockheed Constellation N749NL, which is in the last phases of restoration and will fly back to Lelystad. Source: press briefing issued by www.fokkerf27.nl, the F27 Friendship Association (kindly relayed to me by Michael Prophet). I like to express my gratitude to Peter Baeten who provided me with a thorough history on Neptune "210" (but I accept any responsibilty for possible mistakes, having translated and revised the text).